I thought you might like to see the completed Maine morning mitts. I cajoled YoungB into being the photographer, but he was about to dash off, so the result is what you see. The angle is less than desirable. All the same, I’m sure you’ll get the idea. I can vouch for the fact that they are very thick and very warm. They made my hands sweaty! PS: Sorry about all the “later than usual” bits and the bits that didn’t really make sense in yesterday’s post. They resulted from and/or were indicative of my general mental woolliness! Sitting in a car and not having to drive is quite a treat. Also, sitting about waiting for cyclists is quite a treat. Watching movies you’ve already seen might fall into that category, too. You can get lots of knitting done! A quick, easy pattern deserving of beautiful yarn but here made with some unexciting stash yarn. These are Maine-morning mitts, started on Christmas Day and doing very well, thank you. No, they’re not in a beautiful yarn that showcases lovely colours like the proper thing. But they are in colours worn by the intended recipient whose hands they’ll keep warm; for that, a pretty colourway is not the whole story. Something thick and cosy is also important. The decision to knit these having been an extremely last-minute one, I used what I had in stash, pairing some self-striping yarn with a related-in-tone plain yarn to get the requisite thickness. 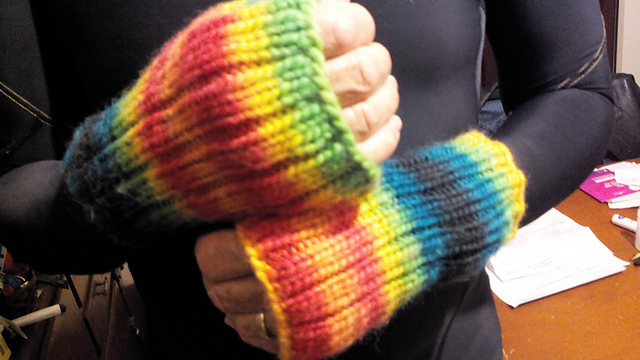 The fingerless mitts pattern I usually use has a definite left hand and a definite right hand. These do not and, as you’ll observe, I haven’t yet finished the thumb on the first mitt. That requires a bit more concentration than I could muster when sitting in the car and joining in the conversation. I thought, however, that I could probably just leave those isolated thumb stitches and keep going with the second mitt until I had the main part of both done. Seems to be working so far. How about you? If you’ve been travelling, have you managed to make the most of any opportunities? Good luck with your output.